Noosa: Yellow fin Tuna, grass sweetlip and coral trout from Sunshine Reef. Good numbers of big flathead from the river mouth. Mangrove jack and trevally from Weyba creek and Woods bay at night on live bait. Bream and whiting along Noosaville stretch. Maroochydore: Good numbers of whiting up to 35cm in the southern channel and off Chambers Island. Mangrove jacks to 57cm in the canal system and in the upper reaches on live bait. Flathead up to 70cm from the river Mouth. Plenty of good mud crabs in the creeks and upper reaches. Kawana: Snapper and grass sweetlip from Murphy’s Reef and the Inner Gneerings. Whiting and bream from La balsa park. Grunter bream and whiting in the upper reaches. Trevally and bream from the Rock walls during the incoming tide. Caloundra: Mangrove jack in Bells Creek and Coochin Creek. Flathead and bream from Military Jetty on live herring and prawns. Whiting and bream along Golden Beach. Mud crabs throughout the passage in good numbers. Blake and Corey Awes and Shaun Garland caught these nice whiting and grunter bream while fishing at the Twin Waters weir. Noosa: Cobia and Perl perch on North reef. Yellow fin Tuna, grass sweetlip and coral trout from Sunshine Reef. Good numbers of flathead from the river mouth. Mangrove jack and trevally from Weyba creek. Bream and whiting along Noosaville stretch. Maroochydore: Good numbers of whiting in the southern channel and Chambers Island. Mangrove jacks to 57cm in the canal system. Whiting, bream and flathead from cotton Tree. Plenty of good mud crabs in the creeks and upper reaches. 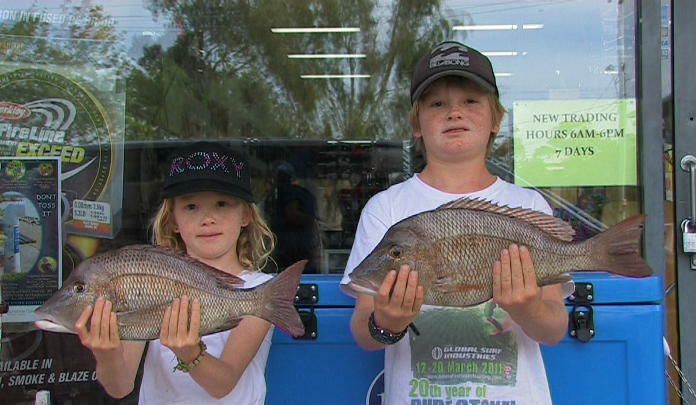 Kawana: Snapper to 6kg and grass sweetlip from Murphy’s. Whiting and bream from La balsa park. Grunter bream and whiting in the upper reaches. Plenty of buck mud crabs in the deeper holes in the middle reaches. 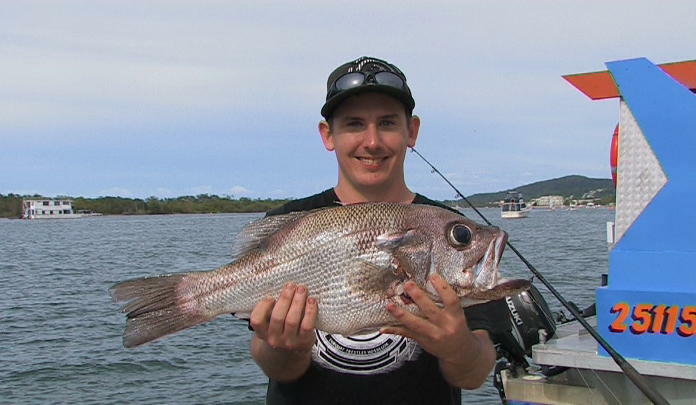 Shane Traque with a nice 3.6kg pearl perch which was caught at North Reef. Noosa: Cobia and Perl perch on North reef. Yellow fin Tuna, grass sweetlip, Maori cod and coral trout from Sunshine Reef. Trevally, bream, whiting and flathead from the river mouth. Bream and whiting along Noosaville stretch. Maroochydore: Whiting in the southern channel. Whiting, flathead and grunter bream from the Twin Waters weir on live bait and soft plastics. Whiting, bream and flathead from the bank at cotton Tree. Plenty of good mud crabs in the creeks and upper reaches. Kawana: Snapper to 6kg and grass sweetlip from Murphy’s. Dart, bream, whiting and dusky flathead along the Kawana stretch. Grunter bream and whiting in the upper reaches. Plenty of buck mud crabs in the deeper holes in the middle reaches. Caloundra: Small trevally and queenfish in Pelican Waters canal. Mangrove jack in Bells Creek. Flathead and bream from Military Jetty. Whiting and bream along Golden Beach. Mud crabs throughout the passage in good numbers. Noosa: Cobia on north reef. Yellow fin Tuna, grass sweetlip, Maori cod and coral trout from Sunshine Reef. Trevally, bream, whiting and flathead from the river mouth. Bream and whiting from the frying Pan. Mangrove jacks and trevally from Woods Bay at night. Maroochydore: Whiting to 38cm and a few flathead in the southern channel. 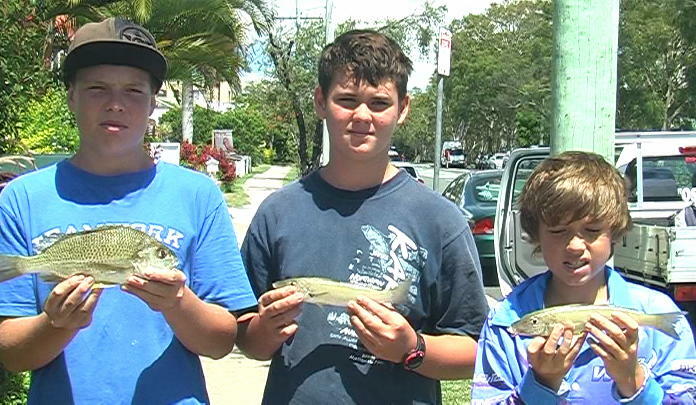 Whiting, bream and flathead from the bank at cotton Tree. Plenty of good mud crabs in the creeks and upper reaches. Kawana: Spotty mackerel to 5kg around the NW fairway beacon. The odd Spanish mackerel from the outer gneerings. Cobia from the gneerings. Snapper to 6kg and grass sweetlip from Murphy’s and the outer gneerings. 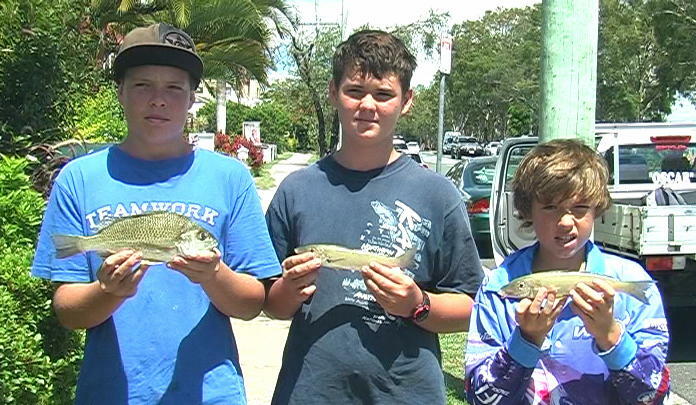 Big dart, bream, whiting and dusky flathead along the Kawana stretch. Plenty of buck mud crabs in the deeper holes in the middle reaches. Caloundra: Flathead, bream, cod and trevally from the Boardwalk. Mud crabs throughout the passage in good numbers. Small trevally and queenfish in Pelican Waters canal. Mangrove jack in Bells Creek. Whiting and bream along Golden Beach. Blake, Corey and Sean where enjoying the school holidays with a spot of fishing when they hooked into whiting and grunter bream from the Twin Waters Reach. Noosa: Cobia on north reef. Yellow fin Tuna, grass sweetlip, Maori cod and coral trout from Sunshine Reef. Trevally, bream, whiting and flathead from the river mouth. Bream and whiting Whiting from the frying Pan. Mangrove jacks and trevally from Woods Bay at night. Maroochydore: Elbow slapper whiting to 38cm in the southern channel. Whiting, bream and flathead in the lower river. Mangrove jacks, trevally and bream from Duporth Ave on live bait at night. Golden trevally on the dirty watermark on the mid making tide in the lower river. Flathead from Cotton Tree. Plenty of good mud crabs in the creeks and upper reaches. 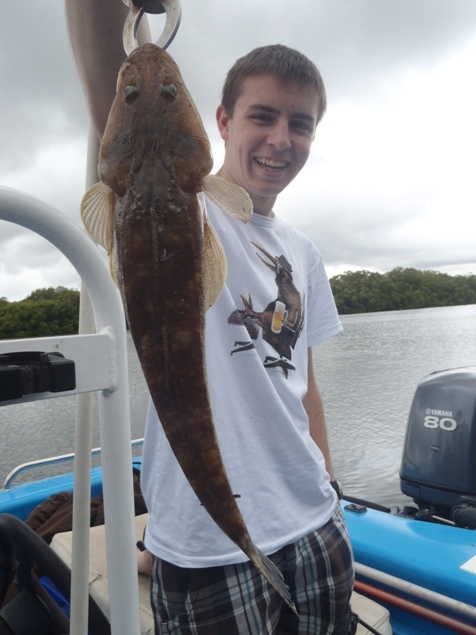 Andrew caught this quality flathead from the Maroochy River on a soft plastic while fish with Anglers Advantage.